When it comes to baby carriers, there are so many colors, brands, shapes, budgets and designs that it would be a daunting task to try to repertoriate them all. If you are new to the babywearing world, it might be overwhelming to look at all the options trying to find out whats best for baby and you. What to ask yourself when choosing a carrier? Making a choice depends on baby and you. Ask yoursef: "what are my needs?" When will you mostly use the carrier: indoor, outdoor, social gatherings, long walks, etc.? What will you mostly use it for: running errands, doing housework, carrying baby for walks, bonding, soothing? What carrier fits my baby's needs: how hold is your little one? how much does he weights? How developed is his spine? How well maintained is his neck? What do you priviledge: easyness? rapidity? comfort? style? Will you be the sole user? Or maybe others will be using the carrier too? How long will you babywear and up to what age/weight would you like your carrier to go? What is your budget? Do you plan on reselling your carrier once you don't use it anymore? 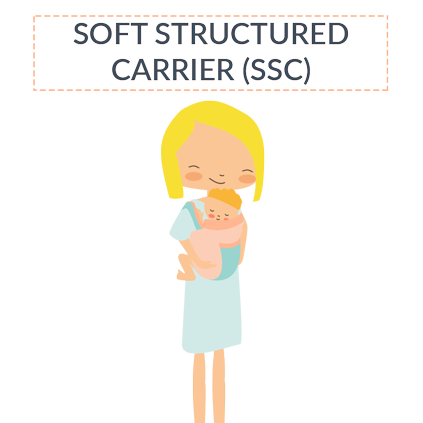 Many caregivers appreciate the easiness and comfort of soft structured carriers (SSC). When people think about babywearing, it is often what they picture, or what they have seen most. Also known as full buckles, SSC can be used from birth (3,2kg) with an infant insert, up to 27kg (60 pounds) for toddler specific carriers as the Tula Toddler or Beco Toddler. Most soft structured carrier have a padded waistband closing with either Velcro or buckles, padded adjustable shoulder straps for comfort and can be used in front, hip and back carriers. Baby size carriers can be used without an insert from around 4 to 6 months, depending on your little one: please check for cues that will help you determine if your baby is ready! Does your little one have good neck and head control? Does he catches his feet? How does he position himself when carried on your hip? The leg opening should never be forced, if baby is not opening enough, please just wait a little longer 🙂 Cues that the legs are not opened enough yet would be an unbalanced child in the carrier and/or the legs being straight instead of folded back around the carrier seat. There are so many different ones that there is a soft structured carrier for every parent, child, wallet and taste out there! Most renown brands of ergonomic soft structured carriers include Ergobaby, Manduca, Tula, LILLEbaby, or Boba. You will find many more brands on the market, please before buying make sure that your carriers has a base wide enough to be ergonomic and provide your child with the support they need without putting pressure on the base of the spine. 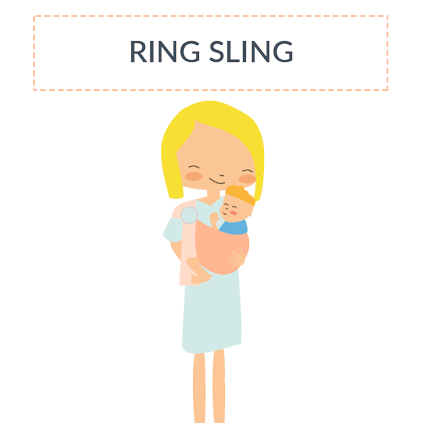 A ring sling is piece of fabric about 2 meter long where a pair of rings is securely sewn to one side, allowing you to carry baby on one shoulder securely from birth to toddlerhood. Ring slings are a modern adaptation coming from the USA of traditional one shoulder carries practiced with a piece of cloth in Mexico and Indonesia, called Rebozo. The tail side of the fabric goes through the rings to secure the pouch in place and is fully adjustable to the baby and the wearer's bodies. Ring slings come in a wide variety of fabrics and designs and include cotton gauze, cotton, wool, silk, linen and more, allowing different qualities as support and softness. They are particularly popular among parents of newborns as they are easy to adjust with a perfectly rounded back and long tail can serve for privacy while breastfeeding. They are also loved by wearers of toddlers as they are fast and easy to adjust for quick ups of walking little ones. 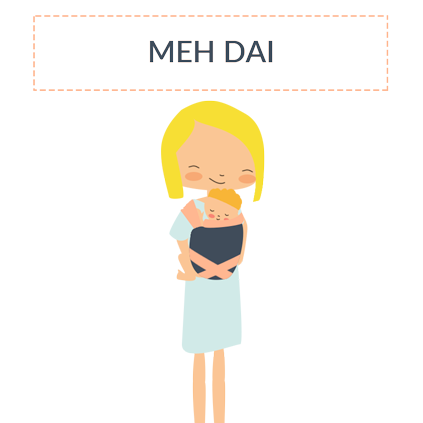 Meh Dai (formerly known as Mei Tai) are modernized Asian-style carriers like the Podaegi or the Onbuhimo. They are somewhat of an hybrid carrier between a soft structured carrier and a woven wrap as they are made of a panel, a fabric belt and 2 long fabric straps that replicate the comfort of woven wraps on the shoulders with the easiness of tying from SSCs. The fact that they have no buckles make them very versatile and easy to share between multiple wearers of different height and shape. They can be used for front, hip and back carries and if the panel is adjustable, from birth to toddler age. They do require a little bit more learning than a soft structure carrier but provide amazing comfort with no bulk. A wrap is a long piece of fabric made to carry a baby. There are 2 main types of wraps: stretchy (made of knit jersey, they stretch and are considered ideal for newborns due to their softness) and woven (made of cotton, linen, wool and other fabrics or blend, they can be machine or handwoven). They are the most versatile and traditional type of carrier. They come in a variety of length and will grow with your baby, as you can do multiple types of carries with the single piece of fabric. They can be worn in front, hip or back carries and are breastfeeding-friendly. Wraps can be adjusted perfectly on both baby and wearer’s body to provide the perfect amount of support. They are extremely newborn-compatible as you can perfectly adjust them to rich the right spread squatting position and leg opening. They are ideal for snuggling newborns and great to leave in a nappy bag for quick back carries with a toddler. Wraps exist in endless combination of fabrics, designs and price and can even be used as fashion accessories. Learning to wrap can be intimidating at first but it can easily be mastered with a bit of practice! get the carrier that you love delivered in Malta!